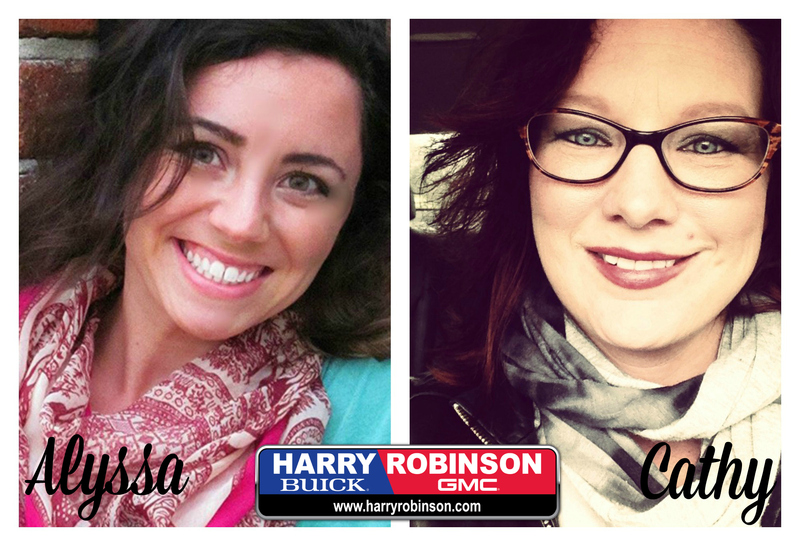 Fort Smith, AR and Salt Lake City, UT –September 12, 2014– Cathy Nesbit, Social Media Director and Alyssa Safty, Internet Manager, of Harry Robinson Buick GMC have been named finalist for the 2014 DrivingSales Best Idea Award, which recognizes the most innovative auto dealership strategies of the year. Nesbit & Safty’s ‘Best Idea’, Free Gas Friday, was selected from a very competitive field and will be presented onstage at the 2014 DrivingSales Executive Summit (DSES), held Sunday, October 12th through Tuesday, October 14th, 2013 at the Bellagio Las Vegas. Harry Robinson Buick GMC’s Free Gas Friday is one of the ways we choose to give back to our customers. We go out every Friday in search of a customer who has bought their vehicle from us. Those customers are identified by finding our HRBG front license plate or HRBG dealer sticker on their vehicle. We give them a $50 gas card and a goodie bag. We video the whole thing documentary style, upload it to our YouTube channel, and share it on our social media networks. These videos spark high engagement rates & elevated customer loyalty. The DSES, which had record attendance in 2013 and has sold out every year since inception, is unique in the industry because auto dealers determine the speakers and agenda, as well as the finalists and winners of the Dealer Best Idea Contest. The 2014DrivingSales Dealer Best Idea Award finalists, selected by a dealer panel, will present their strategies on stage at the DrivingSales Executive Summit on Sunday, October 12th. The dealer panel will determine the winner and runners up. The Dealer Best Idea Award competition is part of an exciting 2014 DSES line-up that includes 30 breakout sessions, as well as keynotes from digital expert and author Brian Solis; SEO ‘Wizard’ Rand Fishkin; eMarketer’s Lead Digital Auto Analyst, Mike Hudson; Kellogg School of Management Marketing Professor Florian Zettelmeyer, and Managing Partner of Eisenberg Holdings Bryan Eisenberg– all of who will provide actionable tactics for issues critical to dealerships. For more information about the DrivingSales Executive Summit and to register before the event sells out, go to www.dses.com or contact dses@drivingsales.com. The DrivingSales Executive Summit is where the most progressive dealers gather to collaborate and learn forward-thinking trends in automotive operations. DSES features world-renowned experts on marketing, technology and retail operations from inside and outside the industry who provide the most valuable and actionable insights for today’s dealership professionals. The DSES agenda is dealer-driven, ensuring the content is 100 percent focused on the needs of progressive dealers. Only the top 10 percent of speaking applications selected by DrivingSales members make it on the agenda. To protect the quality of the event, seating is limited and always held at a 5-diamond venue. DSES has sold out every year. For those interested in attending, securing seating as early as possible is recommended. For more information, visit DSES.com. To stay tuned for DSES news as it develops on www.twitter.com/drivingsales and on facebook.com/drivingsales. Participate in the conversation using #DSES as preparations continue throughout the year.